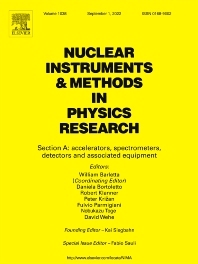 Section A of Nuclear Instruments and Methods in Physics Research publishes papers on design, manufacturing and performance of scientific instruments with an emphasis on large scale facilities. This includes the development of particle accelerators, ion sources, beam transport systems and target arrangements as well as the use of secondary phenomena such as synchrotron radiation and free electron lasers. It also includes all types of instrumentation for the detection and spectrometry of radiations from high energy processes and nuclear decays, as well as instrumentation for experiments at nuclear reactors. Specialized electronics for nuclear and other types of spectrometry as well as computerization of measurements and control systems in this area also find their place in the A section. Theoretical as well as experimental papers are accepted. The journal Nuclear Instruments and Methods in Physics Research offers interested parties the option of fast publication in (supplemental) sponsored issues. For more information please click here.